Help me identify my antique doll. Hello. I bought this doll off of Ebay, and I don't know what company made her or what year she was made. 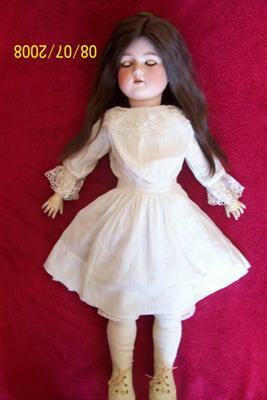 She is a bisque headed antique doll marked "Germany G.B." on the back of her head. She has no other markings. She has an open mouth in which you can see her teeth. The head is in excellent condition. She is 24" tall with original antique human hair wig which has a small tear on the inside of the mesh cap but is not noticeable. Her antique blue sleep eyes work well and still retain the original lashes. When her eyes are shut, the wax coating is cracked. Her head has been inspected and there are no cracks, chips, or repairs. The body is in good condition with normal wear from age and still has all the fingers. She is wearing her original antique dress and bloomers which are in good condition with no stains. If someone could tell me what company made her, where she was made, and what year she was made in, and if possible, what do you think she may be worth? This would be greatly appreciated. Thank you. Comments for Help me identify my antique doll. Hello there - you have a pretty antique doll, made by George Borgfeldt, Germany. Probably made between 1910 and 1925 thereabouts. A lot of GB heads were made by Armand Marseille, Germany, if your doll has AM above or below the GB then that is who the head was made by. As for value, she's probably worth around what you paid for her, since eBay is a good guide for most of the more common dolls. And having said that, although GB and AM are among the most commonly found antique dolls, I have several and the quality is just lovely.